Who was Mary O'Connell? An Angel of the Battlefield • People & Genealogy, Who was? 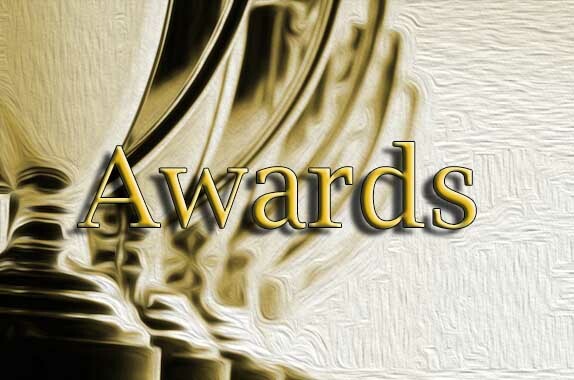 Posted by Sharon Slater | Dec 19, 2013 | People & Genealogy, Who was? Mary O’Connell was born Mary Ellen O’Connell the daughter of William O’Connell (1769-1841) and Catherine Murphy -1826), married in 1805. Little did they know, when she was born on 15 August 1814 in Limerick, what greatness their daughter would go on to achieve. 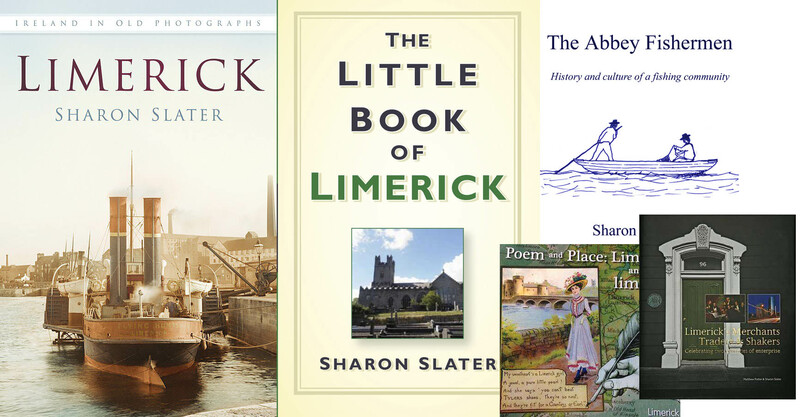 There is scant information available on Mary Ellen’s childhood in Limerick, Ireland and in 1820 she emigrated with her family America. The family settled in Massachusetts, where she attended the Ursuline Academy in Charlestown. Her mother passed away six years later, when Mary was only 12 years old. On the 10 of September 1834 her family became Naturalised Citizens of New England. 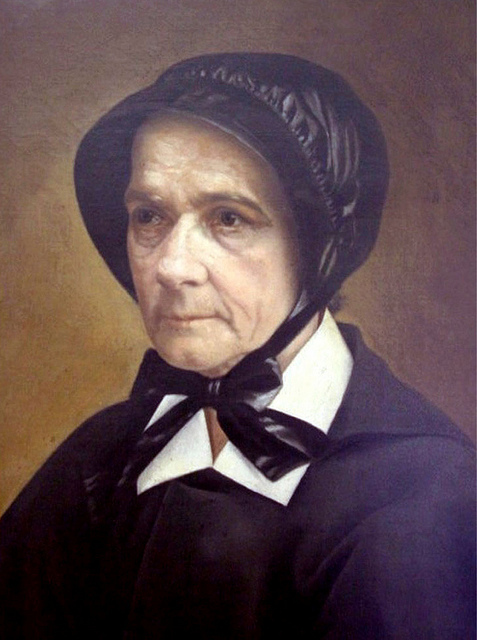 At the age of twenty, on 5 June 1835, Mary chose to devote herself to a religious life and entered the American Sisters of Charity in St. Joseph’s Valley, Maryland. Two years later she attained the status of a Sister, where she took the name Anthony. 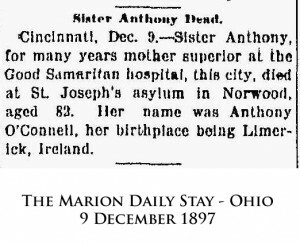 In that same year, 1837, Sister Anthony arrived in Cincinnati, Ohio and began work at St. Peter’s Orphan Asylum and School for girls. She also took charge of the St. Joseph’s Orphan Asylum for boys when it opened in 1852. It wasn’t long until she endeavoured and eventually succeeded in merging the two orphanages. 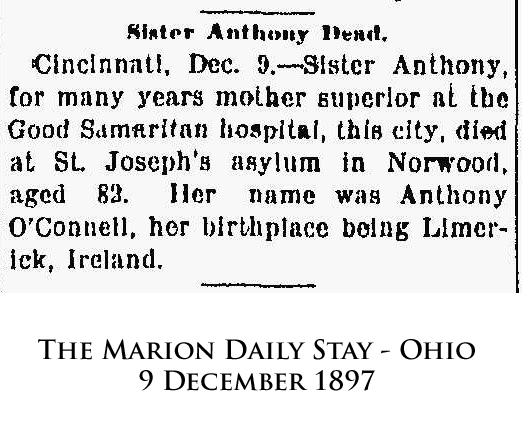 In 1861, at the outbreak of the American Civil War, Sister Anthony, along with approximately 40 other Sisters from her community, volunteered as nurses. Sister Anthony was given the nickname, “Angel of the Battlefield” after serving, along with 9 other sisters, at the battle of Shiloh. This came about as she would fearlessly go out to the battlefield to help bring in the sick and dying. Sister Anthony developed the “Battlefield Triage”. Her method was “the first recognizably modern triage techniques in war zones, saved countless lives through faster hospital treatment and won her praise from President Lincoln”. Her medical skills often allowed her to intervene to save soldiers’ limbs from amputation. In addition to her courageousness and innovation, some even described Sister Anthony’s word was treated as law among officers, doctors and soldiers after establishing herself as a prudent and trusted administrator and nurse. She and other sisters were also often selected to treat wounded prisoners of war due to them showing no bias in serving rebel, yank, white or black soldiers. Sister Anthony O’Connell saw no distinction between Union and Confederate soldiers. She became personally acquainted with Jefferson Davis and knew a number of generals on both sides of the conflict. Sister Anthony went on to serve at the battlefields of Winchester, Virginia; the Cumberland Gap, Tennessee; Richmond, Virginia; Nashville, Tennessee; Gallipolis, Ohio; Culpeper Court House, Virginia; Murfreesboro, Tennessee; Pittsburg Landing, Tennessee; and Lynchburg, Virginia. She also served on a hospital ship on the Ohio River. 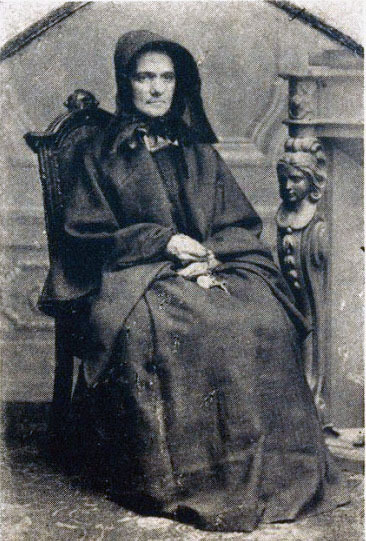 After the war, in 1866, Joseph C. Butler and a friend, Louis Worthington, purchased a large building at Sixth and Lock Street, to present to Sister Anthony as a gift in recognition of her and the sisters service during the war. This was given with two conditions: that no one be excluded from the hospital because of colour or religion, and that the hospital be named “The Hospital of the Good Samaritan,” to honour the sisters’ kindness. Sister Anthony was also recognized for her work during the yellow fever epidemic of 1877. She retired from active service in 1880, on the census of that year she was recorded as Directoress of the Good Samaritan Hospital in Cincinnati where she had both worked and lived. She was in charge of 17 Religious Sisters, 3 Doctors, 3 Lay Nurses, 6 servants and 86 patients. This hospital was widely known as “Sister Anthony’s Hospital”. She passed away in her sleep in December 1897 in Cumminsville, Cincinnati, Ohio. In 1898 the second edition of George Bartons Angels of the Battlefield was released, this gave personal accounts of Sister Anthony as well as other Catholic Sister who served as nurses during the American Civil War.